Would You Sleep with Your Cell Phone Waiting for His Text? At Cyber-Dating Expert, we like to report on the latest trends in online dating and mobile dating apps. Is the digital world getting more complicated or becoming easier with reliance on text messages? Our friends at JDate and ChristianMingle just released their study on the impact of mobile phones and relationships based on a survey of 1500 singles aged 21-50, which we’d like to share with you. I read the in-depth study, The Dating Game: Mobile Technology Redefines the Rules for Singles and realized one thing for sure; the cell phone has replaced a fancy purse as the accessory of choice, that is, unless there?s room for your mobile phone in your purse. While we know the increase in cell phone usage has resulted in a dramatic increase in sending text messages to schedule a date or to stay in touch in between dates, the alarming data of who sleep with their phone in bed with them is startling. According to the survey, 50% of singles think they might be addicted to their cell phones, with 25% of singles 21-26 reporting that they actually sleep with their cell phones in bed with them. For those who don’t feel the need to cuddle with your mobile phone, we found out that many of you are just an arm?s length away from your phone, which is prominently placed on the table next to your bed or on the floor close by. When it’s time to wake up in the morning, what do singles do first? Ahead of brushing their teeth, they reach for their mobile phones. 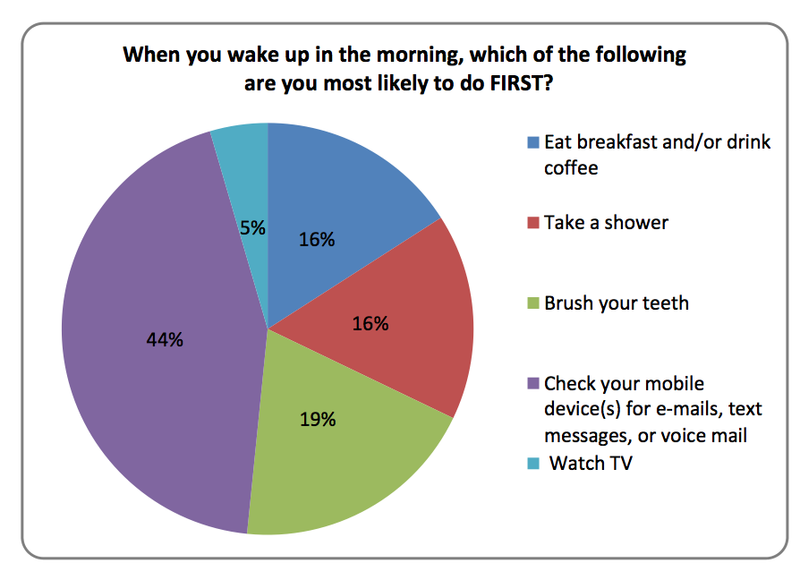 According to the survey a whopping 56% of singles aged 21-26 check their mobile devices for e-mails, text messages, or voicemail (44% overall) as compared to 19% of singles who diligently brush their teeth first before grabbing onto their favorite mobile device. When it’s time to schedule your online date, the survey found that texting is the most popular for those aged 21-26 with 50% saying they’ll text several times a day before their first date. In addition, approximately 1/3 of both men and women believe it’s less intimidating to ask someone out on a date instead of picking up the phone to call. Singles are using texting for digital foreplay and flirting leading up to a date and making reservations for restaurants. Call me old-fashioned, but I still like to hear the sound of someone?s voice on the end of the phone, even if details of scheduling are done via text. 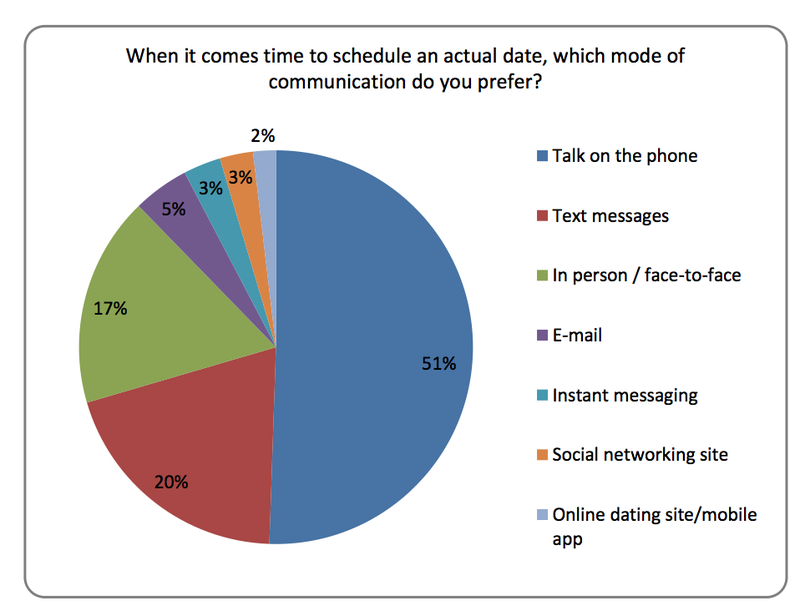 Apparently I’m not alone as the study reported that 68% of singles prefer scheduling a date on the phone as compared to 20% who prefer texting. Now that we know the cell phone isn’t going to be locked in a trunk while on a date, who can’t resist keeping it on the table or sneaking a peek? 98% of singles say they put the phone away on a date, but does that mean they’re still not attached? Not really. Somehow 67% of those surveyed found a way to check their phones, either at the table or in a bathroom break. To the benefit of making us feel good after a date, 78% say they’ll send a text or communication within 24 hours if the date went well. Immediate gratification does have its place. When it’s time to part ways, how should you end your relationship? Of course I believe you should have the conversation in person if geographics allow, but at least by telephone so it’s a two way dialog. According to those surveyed, more than 50% said they would consider ending the relationship in a text message if they were casually dating and 24% would break up in a text message, even if it was a serious relationship. Where are your manners? Read The Text Message Breakup: Who’s Doing It? At the end of the digital day, I believe in treating someone the way that you want to be treated. Don’t let your mobile phone end up higher on the totem pole than your date when you’re sitting at the table, or you might be the recipient of a breakup text, no remorse included. Are you using your mobile phones to schedule dates? Would you check your messages while on a date? Julie Spira is an online dating expert and writes about the marriage of love and technology. She’s the author of the bestseller, The Perils of Cyber-Dating and coaches singles on the dating scene. For more online dating advice, follow @JulieSpira on Twitter and sign up for the free Weekly Flirt.